STARKVILLE, Miss. -- Knowing that people remember and pass on stories while facts are often forgotten, a Mississippi State University horticulture specialist is hosting a series of storytelling events centered on plants. In May, Rick Webb, who with his wife, Susan, owns Louisiana Growers, spoke on functional landscapes, with an emphasis on the value and beauty of using native plants in modern landscapes. His wholesale nursery in Amite, Louisiana, specializes in trees, shrubs, grasses and wildflowers native to the Gulf Coast. “When I see pitcher plants, I see a chorus. I see songs,” Webb said, praising the elegance of a native plant sometimes overlooked as a design element in landscapes. He is a proponent of using native plants and natural design when planning landscapes. He said native plants are good additions to landscapes because they feed and support native wildlife, manage water, have minimal maintenance costs and can restore damage done by previous generations. “We can use our urban landscapes to replace what would have been there,” Webb said. Each month, Denny brings in a speaker from somewhere in the Southeast to talk about plants in an unexpected way. “These are plant talks for people who aren’t into plants. Plant people in general do a pretty good job reaching gardeners. Part of the mission of the trial gardens has been to engage with non-gardeners, to introduce them to a hobby or plants in general. For example, the August speaker is Charles Freeman, an MSU assistant professor of apparel, textiles and merchandising, who will talk about plants from the perspective of fiber. 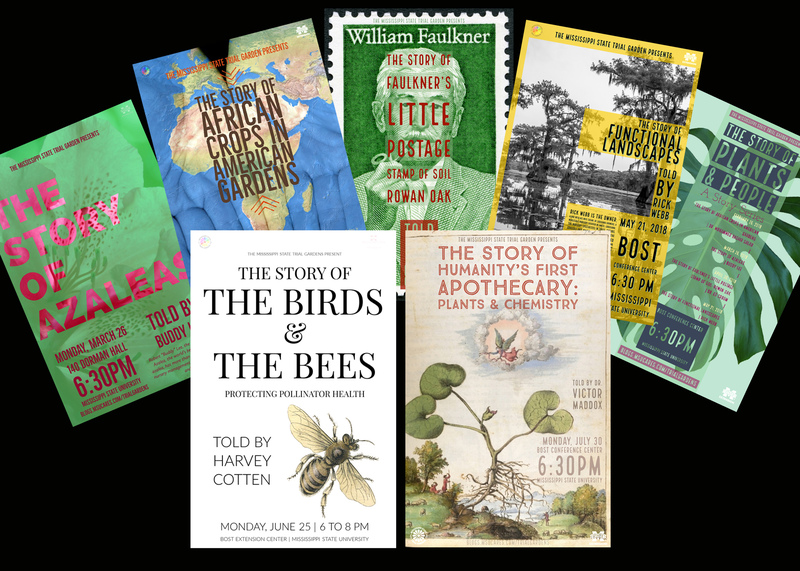 Upcoming topics include The Story of the Birds and Bees: Protecting Pollinator Health on June 25 and The Story of Humanity’s First Apothecary: Plants and Chemistry on July 30. Each session is held at 6:30 p.m. at the MSU Bost Conference Center. Refreshments are provided, and there is no cost to attend. Past storytelling sessions are archived and can be viewed at http://extension.msstate.edu/lawn-and-garden/story-of-plants-and-people.